Atopic dermatitis (AD) is a chronic pruritic dermatosis presented with blotchy, reddening, and raised lesions resulting in erosion, excoriation, and lichenification of the inflicted sites., The lesions can span through the entire body and can occur in flexural or nonflexural regions of joints in the limbs. Flares of acute AD present as oozing, erosive, and inflammatory erythema, whereas chronic persistent lesions appear as pruritic plaques that are hyperkeratotic and lichenified. The itch and appearance of skin lesions can impact the patients' quality of life and psychosocial well-being, extending to limitations in lifestyle activities. The International Study of Asthma and Allergies in Childhood Phase One (mostly 1994–1995) and Three (mostly 2002–2003) repeat multicountry cross-sectional surveys reported the prevalence of eczema symptoms in Taiwan which has increased from 3.5% to 6.7% in the 6–7-year age group and from 1.4% to 4.1% in the 13–14-year age group. A recent international survey reported the estimated prevalence of adult AD ranges from 2.1% to 4.9% across countries. This adult patient population may comprise adult-onset AD together with a quarter of childhood-onset cases who did not grow out of the symptoms. Diagnosis of AD is primarily clinical, based on validated diagnostic standards such as the Hanifin and Rajka's criteria and the American Academy of Dermatology guideline, as no definitive laboratory or pathology markers have been confirmed., The clinical presentation of AD is known to be heterogeneous. Several AD phenotypes have been noted with categorization by age, lesion presentation, concurrent allergic diseases, serum immunoglobulin E (IgE), inflammatory cytokines, genetic mutation, and race. Acute, erythematous lesions are commonly seen in pediatric AD, whereas adult AD may show prominent epidermal hyperplasia with chronicity. The differences in lesion presentations are associated with the corresponding cytokine profiles. Based on the status of IgE-mediated allergic sensitization, patients can be categorized into “extrinsic” AD, with high levels of total IgE and environmental or food allergen-specific IgE, and “intrinsic” AD, which exhibits normal total IgE without allergen-specific IgE. With regard to racial differences, Asian AD lesions have shared features between European-American AD and psoriasis, with more recognizable demarcation and lichenification, as well as higher variations in filaggrin mutation. Although the majority of adult AD lesions share typical flexural distribution and lichenified/exudative patterns as seen in pediatric AD, some may have a nonflexural distribution and atypical morphologic variants, such as nummular, follicular, prurigo-like, and seborrheic dermatitis-like patterns., AD disease severity is highly correlated with therapy selection and treatment outcome. The severity of AD can be assessed by using the Eczema Area Severity Index (EASI) and the Scoring Atopic Dermatitis (SCORAD) index, both of which are validated instruments for scoring the extent and severity of AD lesions. Adult AD is more severe with poor long-term prognosis compared with pediatric AD, and is often inadequately managed by patient education, emollients/moisturizers, and topical corticosteroids (TCS)., Therefore, topical calcineurin inhibitors, burst systemic corticosteroids, phototherapy, and systemic immunosuppressants, including cyclosporine, azathioprine, methotrexate, and mycophenolate mofetil, may be opted in treating moderate-to-severe and recalcitrant AD. However, due to associated toxicities with each immunosuppressive agent, the consensus recommendation is to use the lowest dose and duration possible with monitoring of potential adverse events (AE). In a recent cross-sectional study involving 1519 adults with AD, 55% of the cohort had moderate/severe disease, reporting more severe itching and pain, greater sleep problems, higher prevalence of anxiety and depression, and greater health-related quality-of-life impairment compared to those with mild disease. Among these patients who assessed their diseases as inadequately controlled by systemic immunomodulators or phototherapy, more than half (55.7%) reported higher burdens of itch and sleeping problems. Taken together, there is an unmet need for a safe and effective long-term therapy for AD patients whose disease is inadequately controlled or are intolerant to topical treatments. The emerging therapeutics for AD focuses on the intervention of the Th2 pathway or associated proximal events by target-specific biologics., To this point, monoclonal antibodies against IgE, IL-4 receptor subunit alpha (IL-4Rα), IL-5, IL-13, IL-31 receptor A (IL31RA), IL-33, and TSLP have been evaluated clinically for adult AD. Encouraging results have come from many of the biologics, of which the most exciting being dupilumab, an IL-4Rα antagonist that received Food and Drug Administration approval in 2017 for moderate-to-severe adult AD whose disease is inadequately controlled with topical therapies. Meanwhile, a number of Th2 pathway-blocking biologics are also being tested in asthma or chronic rhinitis with nasal polyps, which are known to exhibit Th2 association. Dupilumab (Dupixent®, Sanofi-aventis US LLC, Bridgewater, NJ, USA) and Regeneron (Pharmaceuticals, Inc., Tarrytown, NY, USA.) is the first biologic approved for the treatment of adult patients with moderate-to-severe AD whose disease is inadequately controlled with topical therapies or when those therapies are not advisable. Dupilumab is given as subcutaneous injections every other week with or without TCS. It is a human monoclonal antibody against IL-4Rα, a shared component of functional IL-4 and IL-13 receptor complexes, and therefore blocks the signals triggered by IL-4 and IL-13 concurrently. In the following sections, data from Phase III trials of dupilumab are summarized. The two Phase III, randomized, placebo-controlled trials (RCT) with identical design were performed in North America, Europe, and Asia to evaluate dupilumab monotherapy in adults with moderate-to-severe AD. Eligible patients were randomized in the ratio of 1:1:1 to groups treated with placebo, 300 mg dupilumab once a week (qw), or 300 mg dupilumab once every other week (q2w) for 16 weeks. The primary end point was the proportion of patients with Investigator's Global Assessment (IGA) of 0 or 1 (clear or almost clear) and reduction of ≥2 scores from baseline. The proportion of patients with ≥75% improvement in EASI score (EASI-75) was a co-primary end point. Improvements in pruritus, quality of life, and symptoms of anxiety or depression were also evaluated. A total of 671 and 708 patients were enrolled in SOLO1 and SOLO2 trials, respectively. At the end of SOLO1, the proportion of patients achieving IGA score of 0 or 1 and improvement ≥2 points was 37% and 38% in those who received dupilumab qw and q2w, respectively, as compared with 10% in the placebo group (P < 0.001) [Table 1]. Similarly, in SOLO2, higher proportion of patients achieved IGA score of 0 or 1 and improvement ≥2 points in both of the treatment groups, compared with the placebo group (36% qw and 36% q2w vs. 8% placebo, P < 0.001). Moreover, significant improvements in co-primary (i.e., EASI-75) and major secondary end points were observed in the treatment groups compared with placebo. As for quality of life measure, 58%‒73% of patients who received dupilumab qw and q2w had ≥4-point improvement in the Dermatology Life Quality Index (DLQI) score (i.e., the minimal clinically important difference), significantly higher than that in the placebo group (28%‒31%, all P < 0.001). The total incidence of nonserious or serious AE did not significantly differ among the groups, although the incidence of injection-site reactions and conjunctivitis occurred at a higher rate in the treatment groups. It was concluded that dupilumab monotherapy given qw or q2w for 16 weeks improved the signs and symptoms of disease in adult with moderate-to-severe AD that was inadequately controlled with topical medications. This 52-week RCT assessed the efficacy of dupilumab with concomitant medium-potency TCS with or without topical calcineurin inhibitor in adults with moderate-to-severe AD. Patients with AD for ≥3 years and IGA score ≥3 plus EASI ≥16 score were enrolled. Responders were defined as those who achieved IGA score of 0 or 1 with improvement ≥2 score from baseline or ≥75% improvement in EASI. In line with SOLO1 and SOLO2, the IGA responder rates in the dupilumab qw and q2w groups at 16 weeks were both 39%, compared with 12% in the placebo group (P < 0.0001). The EASI-75 responder rate at 16 weeks was 64% and 69% in the qw and q2w treatment groups, respectively, compared with 23% in the placebo group (P < 0.0001). At 52 weeks, the IGA and the EASI-75 responder rates were maintained at similar levels across all treatment groups [Table 1], suggesting that the optimal treatment response was achieved early on during the study period. Furthermore, dupilumab significantly reduced the incidence of flares (i.e., proportion of patients with AD flares, dupilumab qw and q2w vs. placebo, 13% and 14% vs. 41%; P < 0.0001) and improved quality of life (i.e., proportion of patients achieving ≥ 4-point improvement in DLQI, dupilumab qw and q2w vs. placebo, 63% and 80% vs. 30%; P < 0.0001). The safety profile evaluated at 52 weeks was not much different from that in SOLO1 and SOLO2. These results demonstrated the long-term safety and efficacy of dupilumab for the management of moderate-to-severe AD with concomitant TCS. The CAFÉ study focused on the adult difficult-to-treat AD population who are intolerant, unresponsive, or ineligible to cyclosporine, which is approved in Europe and Japan for AD. In this study, patients were randomly assigned to dupilumab or placebo with concomitant TCS treatment for 16 weeks. The EASI-75 responder rates were 59% and 63% in the dupilumab qw and q2w plus TCS groups as compared with 30% in the placebo plus TCS group (P < 0.001) [Table 1]. In addition, dupilumab reduced the mean weekly dose of TCS and the number of patients requiring rescue medication, including potent or very potent TCS, topical calcineurin inhibitors, or systemic medication. With regard to quality of life, the proportion of patients achieving ≥4-point improvement in DLQI was 78% and 88% in the dupilumab qw and q2w plus TCS groups as compared with 44% in the placebo plus TCS group (P < 0.001), respectively. Higher rates of mild or moderate conjunctivitis were observed in the dupilumab plus TCS groups than the placebo plus TCS group, but most events were recovered or recovering by the end of treatment. These results supported the use of dupilumab in adults with difficult-to-treat AD. Overall, trials of dupilumab have shown promising clinical efficacy and patient-reported outcomes with acceptable safety profiles. Together with the lack of suitable options in treating moderate-to-severe chronic AD, a multidisciplinary committee in the U.S. recommended that dupilumab should be used as a first-line systemic treatment in adults with moderate-to-severe AD who are uncontrolled with topical therapies. Similarly, the consensus-based European guidelines also recommended dupilumab as a disease-modifying drug when topical treatment is insufficient and other systemic treatments are inadvisable. However, long-term data on the safety and efficacy of dupilumab beyond 1 year, as well as trials that comparing dupilumab with existing systemic therapies, remain to be reported. Additional costs also need to be taken into consideration. Based on the above concerns, other experts recommended using dupilumab in patients with uncontrolled AD despite the adequate use of TCS and treatment failure with one or more oral immunosuppressive drugs. Similarly, recent guidance from the National Institute for Health and Care Excellence also recommended dupilumab as an option for treating moderate-to-severe AD in adults only if the disease has not responded to at least one other systemic therapy, or the systemic therapies are contraindicated or not tolerated. Based on the growing understanding of the pathomechanisms for AD, several biologics and small molecules targeting various AD-related pathways are being investigated in Phase II or III clinical trials., Those that are in or beyond Phase III trials include baricitinib (Janus kinase [JAK] 1/2 antagonist), tradipitant (neurokinin-1 receptor antagonist), tralokinumab (anti-IL-13), upadacitinib, and PF-04965842 (JAK1 antagonist) [Table 2]. Baricitinib with TCS in a Phase II trial (NCT02576938) showed significantly more patients (61% vs. 37%) achieving EASI-50 compared with placebo. A Phase III monotherapy clinical trial is ongoing. Tradipitant has completed Phase II trial (NCT02651714) for adult AD with treatment-resistant pruritus with results yet to be reported. The Phase IIb trial of tralokinumab (NCT02347176) reported that the Dose 3 group had a significant absolute reduction in EASI score at week 12 (adjusted mean difference – 4.94, 95% confidence interval: −8.76 to − 1.13) compared with placebo. The Phase II results for upadacitinib (NCT02925117) has not yet been reported, but a Phase IIb proof-of-concept study of PF-04965842 (NCT02780167) demonstrated that significantly higher proportion of patients achieved IGA of 0 or 1 and a reduction of ≥2 scores from baseline at week 12 in the highest dose group compared with placebo (44.5% vs. 6.3%). Currently, the timing and nature of the first event that ignites the itch-scratch cycle in AD remain inconclusive. Interruption in the itch-scratch cycle is nevertheless considered beneficial in improving inflammation, pruritus, and quality of life. It has been known that the pro-inflammatory cytokine, IL-31, plays a specific role in the occurrence of pruritus associated with AD. Nemolizumab, an anti-IL31RA antibody, was shown to reduce pruritus in patients with moderate-to-severe AD., In the recently published 64-week Phase II results, the improvement of pruritus and sleep disturbance scores by 50% was observed in the first 8 weeks, while that of EASI occurred later in the study [Table 3]. Furthermore, the maximal improvements in EASI, pruritus score, and quality of life occurred after 24 weeks, suggesting a steady and progressive response induced by the intervention. This supports the notion that ameliorating pruritus induced by IL-31 may ultimately improve skin lesions. In a different scenario, where the Th2 immune dominance is the main target of dupilumab, a 50% improvement in EASI score was observed within 4 weeks, whereas steady but significant improvement in pruritus was found starting from week 2. The data from dupilumab indicated that signs and symptoms could be improved early on and maintained by interrupting Th2 signaling. Activation of neuronal IL-4Rα has been shown to sensitize sensory neurons to multiple other pruritogens. Other than inhibiting IL-4's direct pruritogenic properties, it is also likely that dupilumab improved pruritus by blocking downstream signaling of IL-4Rα. The current trend in treating chronic diseases is moving toward a precision medicine approach, which relies on thorough characterization of disease endotypes for targeted treatment development. In comparison to treatment and diagnosis paradigms in asthma and rhinitis, the endotype characterization approach in AD is currently lacking. A recently published observational study focusing on serum biomarkers of AD in the Netherlands proposed 4 endotype clusters of AD [Table 4]. Clusters 1 and 4 had higher levels of Th2 cytokines and higher frequency of the erythematous phenotype compared to cluster 2 and 3. In addition, cluster 4 patients showed distinctively high levels of epithelial cytokine TSLP than cluster 1. In contrast, clusters 2 and 3 had predominantly lichenified phenotype and low Th2 cytokines. Notably, serum IgE levels were not significantly different among the clusters, and comorbid atopic diseases did not correlate with level of Th2 markers. This coincides with the clinical findings that IgE and IL-5 did not present as pan-effective targets in AD., Future interventional studies are needed to confirm the reliability of the endotyping approach and to support the development of precision medicine. To date, there remains an unmet need for safe and effective long-term therapy in adults with moderate-to-severe AD. The growing knowledge of immune-mediated pathomechanisms of AD has led to the development of several new, targeted systemic agents. Dupilumab is a newly approved systemic biologic with promising efficacy and acceptable safety in the adult AD population, and future real-world studies will provide long-term evidence. While dupilumab is already clinically available to adults, its clinical trials for children and adolescents AD are underway (NCT02612454, NCT03345914), including positive Phase III results released for adolescents with inadequately controlled moderate-to-severe AD. Emerging biologics and small molecules targeting various AD-related pathomechanisms are currently under investigation and may provide further benefit in disease control. Nemolizumab, an anti-IL31RA antibody, has been shown to significantly reduce AD pruritus in two phase II clinical trials. Meanwhile, it is hoped that evolving biomarker assessments in the future could provide accurate characterization of AD endotypes and guide treatment planning. The evolution in precision medicine could bring new prospects in the optimal treatment of AD. Writing and editorial assistance in the preparation of this manuscript was provided by Chian-Yi Liu at EMD Asia Scientific Communication (Taiwan branch) Co., Ltd. Support of this assistance was funded by Sanofi Taiwan Co., Ltd. The content of this article was expressed according to the opinions of authors and the manuscript submission for publication was completed with the final approval of all authors. Sanofi reviewed this article for medical accuracy only. One author received consulting fees from Sanofi and has also served as an investigator for AbbVie, Eli Liliy, Pfizer, and Novartis. The other author received consulting fees, travel support, and payment for lectures from Novartis, Pfizer, and Sanofi and has also served as an investigator for AbbVie, Eli Lilly, Novartis, Pfizer, and Sanofi. Boguniewicz M, Alexis AF, Beck LA, Block J, Eichenfield LF, Fonacier L, et al. Expert perspectives on management of moderate-to-severe atopic dermatitis: A multidisciplinary consensus addressing current and emerging therapies. J Allergy Clin Immunol Pract 2017;5:1519-31. Wollenberg A, Barbarot S, Bieber T, Christen-Zaech S, Deleuran M, Fink-Wagner A, et al. Consensus-based european guidelines for treatment of atopic eczema (atopic dermatitis) in adults and children: Part I. J Eur Acad Dermatol Venereol 2018;32:657-82. Silverberg JI, Gelfand JM, Margolis DJ, Boguniewicz M, Fonacier L, Grayson MH, et al. Patient burden and quality of life in atopic dermatitis in US adults: A population-based cross-sectional study. Ann Allergy Asthma Immunol 2018;121:340-7. Barbarot S, Auziere S, Gadkari A, Girolomoni G, Puig L, Simpson EL, et al. Epidemiology of atopic dermatitis in adults: Results from an international survey. Allergy 2018;73:1284-93. Williams HC, Strachan DP. The natural history of childhood eczema: Observations from the British 1958 birth cohort study. Br J Dermatol 1998;139:834-9. Eichenfield LF, Tom WL, Chamlin SL, Feldman SR, Hanifin JM, Simpson EL, et al. Guidelines of care for the management of atopic dermatitis: Section 1. Diagnosis and assessment of atopic dermatitis. J Am Acad Dermatol 2014;70:338-51. Rudzki E, Samochocki Z, Rebandel P, Saciuk E, Gałecki W, Raczka A, et al. Frequency and significance of the major and minor features of hanifin and Rajka among patients with atopic dermatitis. Dermatology 1994;189:41-6. Noda S, Suárez-Fariñas M, Ungar B, Kim SJ, de Guzman Strong C, Xu H, et al. The asian atopic dermatitis phenotype combines features of atopic dermatitis and psoriasis with increased TH17 polarization. J Allergy Clin Immunol 2015;136:1254-64. Czarnowicki T, Esaki H, Gonzalez J, Malajian D, Shemer A, Noda S, et al. Early pediatric atopic dermatitis shows only a cutaneous lymphocyte antigen (CLA)(+) TH2/TH1 cell imbalance, whereas adults acquire CLA(+) TH22/TC22 cell subsets. J Allergy Clin Immunol 2015;136:941-51.e3. Tokura Y. Extrinsic and intrinsic types of atopic dermatitis. J Dermatol Sci 2010;58:1-7. Chen H, Common JE, Haines RL, Balakrishnan A, Brown SJ, Goh CS, et al. Wide spectrum of filaggrin-null mutations in atopic dermatitis highlights differences between Singaporean Chinese and European populations. Br J Dermatol 2011;165:106-14. Ozkaya E. Adult-onset atopic dermatitis. J Am Acad Dermatol 2005;52:579-82. Kulthanan K, Boochangkool K, Tuchinda P, Chularojanamontri L. Clinical features of the extrinsic and intrinsic types of adult-onset atopic dermatitis. Asia Pac Allergy 2011;1:80-6. Schmitt J, Spuls PI, Thomas KS, Simpson E, Furue M, Deckert S, et al. The harmonising outcome measures for eczema (HOME) statement to assess clinical signs of atopic eczema in trials. J Allergy Clin Immunol 2014;134:800-7. Kantor R, Silverberg JI. Environmental risk factors and their role in the management of atopic dermatitis. Expert Rev Clin Immunol 2017;13:15-26. Otsuka A, Nomura T, Rerknimitr P, Seidel JA, Honda T, Kabashima K, et al. The interplay between genetic and environmental factors in the pathogenesis of atopic dermatitis. Immunol Rev 2017;278:246-62. Gittler JK, Shemer A, Suárez-Fariñas M, Fuentes-Duculan J, Gulewicz KJ, Wang CQ, et al. Progressive activation of T(H)2/T(H) 22 cytokines and selective epidermal proteins characterizes acute and chronic atopic dermatitis. 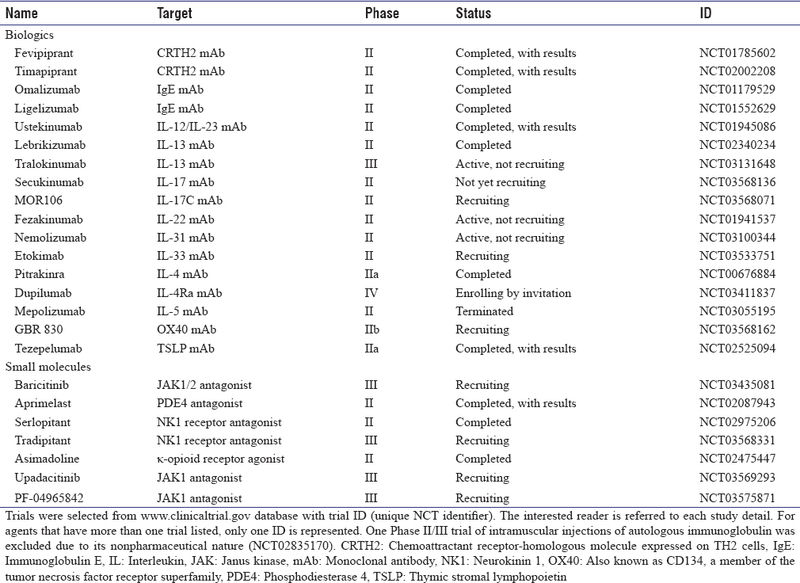 J Allergy Clin Immunol 2012;130:1344-54. Scadding G. Cytokine profiles in allergic rhinitis. Curr Allergy Asthma Rep 2014;14:435. Renauld JC. New insights into the role of cytokines in asthma. J Clin Pathol 2001;54:577-89. Gandhi NA, Bennett BL, Graham NM, Pirozzi G, Stahl N, Yancopoulos GD, et al. Targeting key proximal drivers of type 2 inflammation in disease. Nat Rev Drug Discov 2016;15:35-50. Sonkoly E, Muller A, Lauerma AI, Pivarcsi A, Soto H, Kemeny L, et al. IL-31: A new link between T cells and pruritus in atopic skin inflammation. J Allergy Clin Immunol 2006;117:411-7. Salimi M, Barlow JL, Saunders SP, Xue L, Gutowska-Owsiak D, Wang X, et al. Arole for IL-25 and IL-33-driven type-2 innate lymphoid cells in atopic dermatitis. J Exp Med 2013;210:2939-50. Nomura T, Honda T, Kabashima K. Multipolarity of cytokine axes in the pathogenesis of atopic dermatitis in terms of age, race, species, disease stage and biomarkers. Int Immunol 2018;30:419-28. Chu CY, Lee CH, Shih IH, Chen HC, Huang PH, Yand CY, et al. Taiwanese dermatological association consensus for the management of atopic dermatitis. Dermatol Sin 2015;33:220-30. Megna M, Napolitano M, Patruno C, Villani A, Balato A, Monfrecola G, et al. Systemic treatment of adult atopic dermatitis: A review. Dermatol Ther (Heidelb) 2017;7:1-23. Simpson EL, Guttman-Yassky E, Margolis DJ, Feldman SR, Qureshi A, Hata T, et al. Association of inadequately controlled disease and disease severity with patient-reported disease burden in adults with atopic dermatitis. JAMA Dermatol 2018;154:903-12. Lee DE, Clark AK, Tran KA, Shi VY. New and emerging targeted systemic therapies: A new era for atopic dermatitis. J Dermatolog Treat 2018;29:364-74. Gooderham MJ, Hong HC, Eshtiaghi P, Papp KA. Dupilumab: A review of its use in the treatment of atopic dermatitis. J Am Acad Dermatol 2018;78:S28-36. Simpson EL, Bieber T, Guttman-Yassky E, Beck LA, Blauvelt A, Cork MJ, et al. Two phase 3 trials of dupilumab versus placebo in atopic dermatitis. N Engl J Med 2016;375:2335-48. Blauvelt A, de Bruin-Weller M, Gooderham M, Cather JC, Weisman J, Pariser D, et al. Long-term management of moderate-to-severe atopic dermatitis with dupilumab and concomitant topical corticosteroids (LIBERTY AD CHRONOS): A 1-year, randomised, double-blinded, placebo-controlled, phase 3 trial. Lancet 2017;389:2287-303.
de Bruin-Weller M, Thaçi D, Smith CH, Reich K, Cork MJ, Radin A, et al. 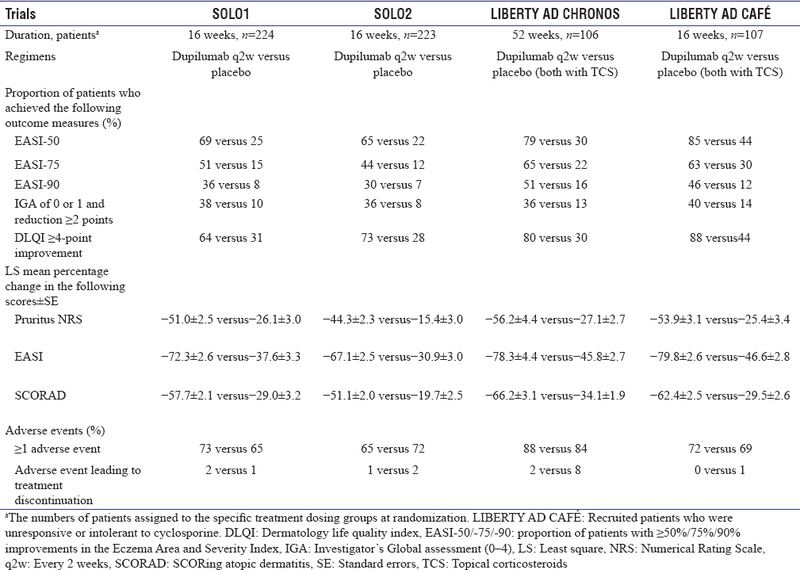 Dupilumab with concomitant topical corticosteroid treatment in adults with atopic dermatitis with an inadequate response or intolerance to ciclosporin A or when this treatment is medically inadvisable: A placebo-controlled, randomized phase III clinical trial (LIBERTY AD CAFÉ). Br J Dermatol 2018;178:1083-101. Wollenberg A, Barbarot S, Bieber T, Christen-Zaech S, Deleuran M, Fink-Wagner A, et al. Consensus-based European guidelines for treatment of atopic eczema (atopic dermatitis) in adults and children: Part II. J Eur Acad Dermatol Venereol 2018;32:850-78. Ariëns LF, Bakker DS, van der Schaft J, Garritsen FM, Thijs JL, de Bruin-Weller MS, et al. Dupilumab in atopic dermatitis: Rationale, latest evidence and place in therapy. Ther Adv Chronic Dis 2018;9:159-70. National Institute for Health and Care Excellence. Dupilumab for Treating Moderate to Severe Atopic Dermatitis (Technology Appraisal Guidance [TA534]). National Institute for Health and Care Excellence; 2018. Available from: https://www.nice.org.uk/guidance/ta534. [Last accessed on 2018 Dec 05]. Paller AS, Kabashima K, Bieber T. Therapeutic pipeline for atopic dermatitis: End of the drought? J Allergy Clin Immunol 2017;140:633-43. Nygaard U, Vestergaard C, Deleuran M. Emerging treatment options in atopic dermatitis: Systemic therapies. Dermatology 2017;233:344-57. Mollanazar NK, Smith PK, Yosipovitch G. Mediators of chronic pruritus in atopic dermatitis: Getting the itch out? Clin Rev Allergy Immunol 2016;51:263-92. 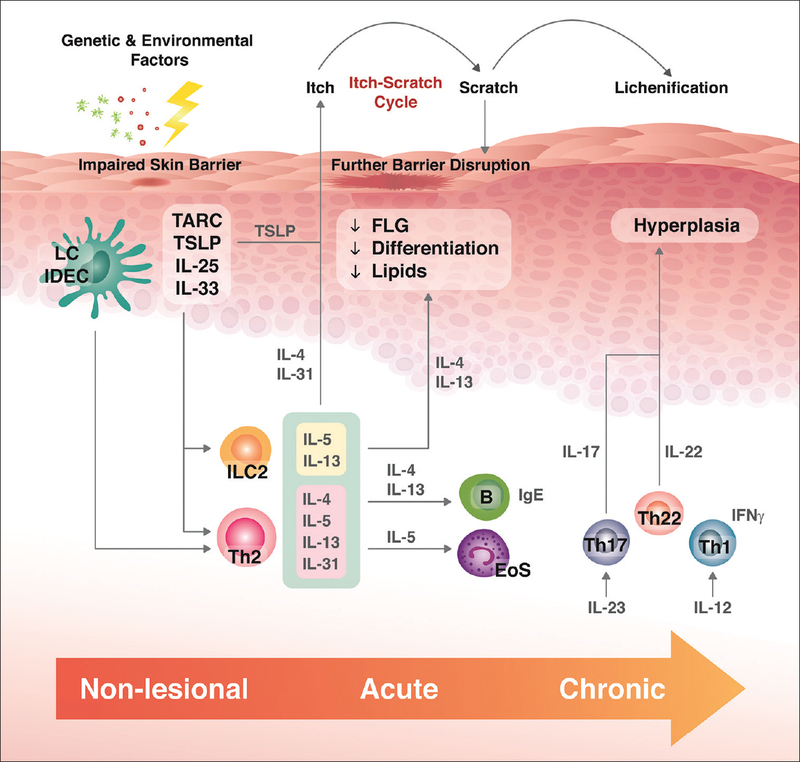 Rerknimitr P, Otsuka A, Nakashima C, Kabashima K. The etiopathogenesis of atopic dermatitis: Barrier disruption, immunological derangement, and pruritus. Inflamm Regen 2017;37:14. Kini SP, DeLong LK, Veledar E, McKenzie-Brown AM, Schaufele M, Chen SC, et al. The impact of pruritus on quality of life: The skin equivalent of pain. Arch Dermatol 2011;147:1153-6. Oetjen LK, Mack MR, Feng J, Whelan TM, Niu H, Guo CJ, et al. Sensory neurons co-opt classical immune signaling pathways to mediate chronic itch. Cell 2017;171:217-.28E+15. Wilson SR, Thé L, Batia LM, Beattie K, Katibah GE, McClain SP, et al. The epithelial cell-derived atopic dermatitis cytokine TSLP activates neurons to induce itch. Cell 2013;155:285-95. Kabashima K, Furue M, Hanifin JM, Pulka G, Wollenberg A, Galus R, et al. Nemolizumab in patients with moderate-to-severe atopic dermatitis: Randomized, phase II, long-term extension study. J Allergy Clin Immunol 2018;142:1121-30.e7. Ruzicka T, Hanifin JM, Furue M, Pulka G, Mlynarczyk I, Wollenberg A, et al. Anti-interleukin-31 receptor A antibody for atopic dermatitis. N Engl J Med 2017;376:826-35. Muraro A, Lemanske RF Jr., Hellings PW, Akdis CA, Bieber T, Casale TB, et al. Precision medicine in patients with allergic diseases: Airway diseases and atopic dermatitis-PRACTALL document of the European Academy of Allergy and Clinical Immunology and the American Academy of Allergy, Asthma & Immunology. J Allergy Clin Immunol 2016;137:1347-58. Thijs JL, Strickland I, Bruijnzeel-Koomen CA, Nierkens S, Giovannone B, Csomor E, et al. Moving toward endotypes in atopic dermatitis: Identification of patient clusters based on serum biomarker analysis. J Allergy Clin Immunol 2017;140:730-7. Oldhoff JM, Darsow U, Werfel T, Katzer K, Wulf A, Laifaoui J, et al. Anti-IL-5 recombinant humanized monoclonal antibody (mepolizumab) for the treatment of atopic dermatitis. Allergy 2005;60:693-6. Heil PM, Maurer D, Klein B, Hultsch T, Stingl G. Omalizumab therapy in atopic dermatitis: Depletion of igE does not improve the clinical course – A randomized, placebo-controlled and double blind pilot study. J Dtsch Dermatol Ges 2010;8:990-8.